In a sit-down with Shane Laprade and Ladleah Dunn, we discussed how to market Kalliste Yacht Services with a Facebook business page, which they had already set up for their business. “I kept thinking social media and boats, social media and boats, how the heck can I make that work?” said Ladleah. “You don’t necessarily associate boat work with the up-and-coming digital world. So I got to thinking…there are all these Facebook fan pages out there ranging from garlic to crocheting, and Shane and I tend to be obsessed with boats, particularly the kind we own, the Tayana. We knew so many other people loved the Tayana too. From a business marketing standpoint, I thought it would be really smart for us to build a fan page around the Tayana.” Ladleah began researching online for any Facebook pages dedicated to the Tayana, and to her amazement, couldn’t find even one! So she put together a Facebook business fan page titled Tayana 37. That’s the power of starting a Facebook fan page—something you can easily do too, if you follow certain guidelines. 1. You love the topic: First, make sure this is something you are passionate about, because once you give life to a Facebook fan page, it is your responsibility to update content on it regularly. And that takes time. So be sure you have the time dedicated to do this (or can outsource it) because if you let the fan page languish, you not only let your fans down but it shows apathy from a marketing standpoint. 2. Group or Business Page: Facebook gives you the option of starting a group page or a fan page for your topic. As Ladleah found when she experimented with both, a fan page is more accessible to your audience and what most people use. 3. Know your audience: Ladleah and Shane were smart enough to understand the needs of this page’s fans. Fans “liked” their fan page because they wanted information associated to the Tayana 37, not just what Kalliste Yacht Services offered. There is an intimate level of interaction in relating to fans so if you are only using it to promote your business, fans will feel they are being “sold” to and will abandon your page. 4. What to post: The key to a successful page comes down to what content you choose to post. Think like your fans and make it interesting. 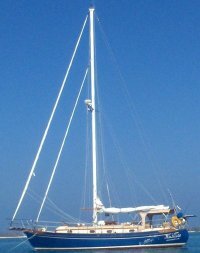 On the Tayana 37’s page, wall posts link to sea stories, popular Caribbean bars and “how to cook on a boat” recipes. The idea is to scour the ‘Net for interesting tidbits related to your fan page’s topic and share it with your audience regularly. 5. Don’t Worry About Numbers: This story goes to show that even a new fan page with only 91 fans will shoot straight to the top of search engine results—if it is unique. Don’t assume that a fan page under 1,000 or even under 500 fans should be discounted. As this fan page has already proven, notoriety can be measured in other ways. 6. Content For Other Facebook Wall Tabs: As mentioned, your wall content is considered your “evergreen content”--the kind of posts that make more people want to be part of your community. But what should you include in “Info,” “Photos” and “Discussions”—or even customized tabs? You can include video, links, and even synch your Twitter account posts into a Facebook wall tab. See how it’s done here. These are the appropriate places to put more information about your business. People will look here to find out more about you, your reasons for starting a fan page and what you can offer. But don’t just copy and paste from your website. Remember, this is social media. Give them something interesting. If you want a consultation on how to provide intuitive and engaging content for your Facebook fan page, including how to customize tabs, see what I can do for you specifically around Facebook services and give me a shout. I can set it up for you and teach you how to post the kind of content that your fans are looking for.